Begun in 1939 in London, where Mondrian had fled from Paris the year before, Abstraction was completed in New York, where he arrived in 1940 to escape the quickly spreading dangers of World War II. The Axis attack on Pearl Harbor, in December 1941, took place just as he put the finishing touches to the work for a January 1942 exhibition. In most respects Abstraction is one of the culminating paintings in a stark, hallmark mode that Mondrian had developed by 1921 in dialogue with his fellow Dutch artists of the De Stijl movement. But a new sense of adventure, characteristic of Mondrian’s final New York works, is expressed in such details as the absence of black bordering lines for the red rectangles located along the right and bottom edges. Abstraction retains its vibrant, unvarnished surface and also its original frame. Mondrian himself claimed, as far as he knew, to be the first artist to bring the painting forward from the frame rather than setting it within; in so doing, he eliminated the tendency of the traditional frame to lend an illusionistic depth to the painting. The wide, recessed borders enhance the ease and safety of handling his works and also harmonize with their spare aesthetic. The state of preservation of Abstraction is so exception that is serves as a touchstone in understanding the artist’s late technique. Labored reworkings were a normal part of Mondrian’s process, and this is reflected in the manner in which he dated Abstraction, signing it “PM” and “39/42,” the years it was begun in Paris and completed in New York. In addition to the unbounded red square inserted into the yellow field at the bottom, other changes can be seen with the aid of a microscope. The small red square at the upper right edge was originally blue, the blue square a darker blue, and the small red square at the bottom right edge a deeper red. 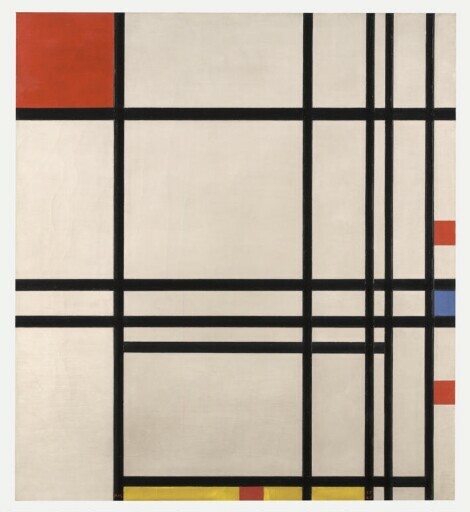 Additionally, Mondrian reworked the black lines in the composition, adding a third horizontal bar below center. The artist’s working technique was very fastidious, and he scraped away paint down to the ground when making even small changes to the position of the grid lines and color fields. The surface texture of the black lines is rougher where they have been scraped and repainted. An examination of the painting under transmitted infrared light reveals the degree to which the lines were shifted, because the light passes more readily through the thinned areas where the paint was scraped away. The painting is preserved in its original unvarnished state, though Mondrian selectively coated the black lines to give them emphasis. Under ultraviolet light one can see where the coating was doubled at the intersection of lines, because the fluorescence is brighter in those areas. It is fortunate that the Kimbell’s painting has never been separated from its original frame, since frames were such an important part of Mondrian’s aesthetic that he made them himself. purchased by Kimbell Art Foundation, Fort Worth, 1994.